Your little ones are stuck in a world of adult sized furniture, sinks and counter tops. 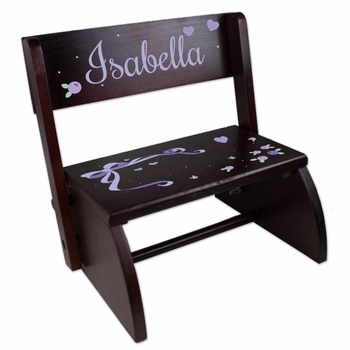 Give them a hand, with these Personalized Children's Step Stools! Perfect for the kitchen, bathroom, or for just a little help climbing into bed. Available in White, Natural or Espresso as shown. Artwork imprinted with permanent non-toxic ink. This versatile stool is crafted with a hinged back to create their very own seat, or folds down to help kids reach the sink or climb into bed. What makes these so much more special is the unique digitally imprinted artwork applied to each one! Select from over 70 adorable designs for both girls and boys. Click on More Images above to see design examples on stools. Note: The designs shown on the Design Choices page is exactly what will be imprinted on your stool. I purchased this back in 2016, as gift. The new parents loved it! And, many others gave many compliments to my gift! This year, 2017, I'm purchasing again, for another gift to new parents. Awesome furniture for the mini-me that fits any decor, that will grow with the children for many years! Thank you Simply Unique Baby Gifts! The artwork that was done on this stool was just amazing. You can tell it's personalized to your order and the quality is very apparent. I love that it has 2 uses... a step stool and a chair. My daughter loves using it to watch elmo or movies... it's "her" chair, just like dad has one. I even got my sister-in-law one for her shower and have another one on order for another friend due in September! The only thing i wish is that it be a little higher of a step as my youngin' still can't reach the sink while standing on it. She'll grow into it though! I highly recommend it for a unique gift for any baby shower. The espresso is a beautiful color! I was so excited to see this offered in this new color! I have bought the white ones for my friends before and the latest one I wanted to buy was for someone that loves the color espresso. The new color came out just in time for her baby's birth! Thank You for this new color! He is potty training now and is able to wash his own hands afterwards because now he can reach the sink! ProsIt is a beautiful Espresso color and his name looks great on there. Personalization process on this product requires longer period of time and totally worth the wait. Please read the Description below the picture for instructions on how to choose your design.